I have been on the lookout for a winter coat for the past few years. It’s something I find incredibly difficult to get – a coat that is warm (so must have some wool content), stylish, feminine and practical. Over the years I’ve had a range of different coats, from double-breasted to parkas, but I’ve never found anything I absolutely adore. This winter, I started looking early. I tried a number of coats from George at Asda and even purchased one for around £25. However the first time I wore it on a cold day I knew I’d have to replace it as it offered me very little warmth, due to the fact it had no wool content at all. I later upped my budget and tried a few from Designers At Debenhams. There were some lovely coats but again nothing was quite right on me. One day, when I was browsing the Collectif site admiring their pretty dresses (something I do quite often), I happened upon their Jackets and Coats section. There were several lovely coats to choose from but my attention quickly turned to the gorgeous Ashley. I absolutely fell in love on first sight! 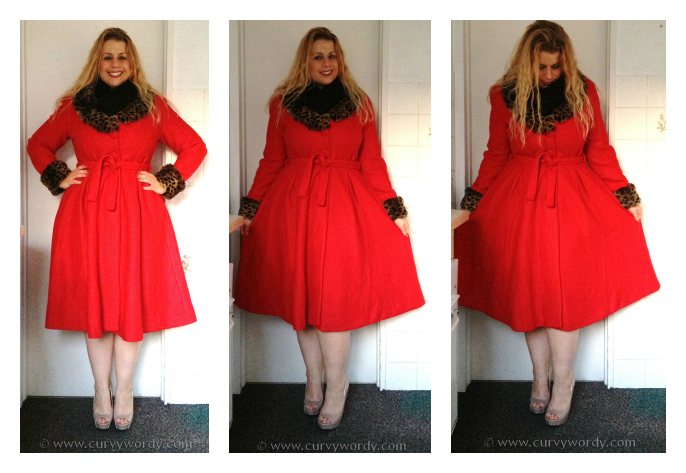 The colours, the shape, the collar and cuffs…it all added up to quite possibly the most beautiful coat I had ever seen. On a trip to London in autumn 2012 I popped into the Collectif store at Covent Garden and tried on the green version of the Ashley in size 16. I adored it every bit as much as I’d hoped. The cut was divine and the flared skirt looked amazing. Although the size 16 was a little roomy on the waist, it was tight on the bust and in the arms so I knew I’d have to go for an 18. Unfortunately there was not one in store so I walked away empty-handed and resolved to buy one online instead. I also decided to go for black as it’s the most practical colour. I thought for a time that the £154.50 price tag seemed a little steep and I ummed and ahhed for a short while but then I reminded myself how long I had been looking for a coat and suddenly it seemed to make sense. However my hesitation cost me dear – when I went back to the Collectif website to purchase the black version I was horrified to see it had sold out. In fact, all three colours were completely out of stock online. 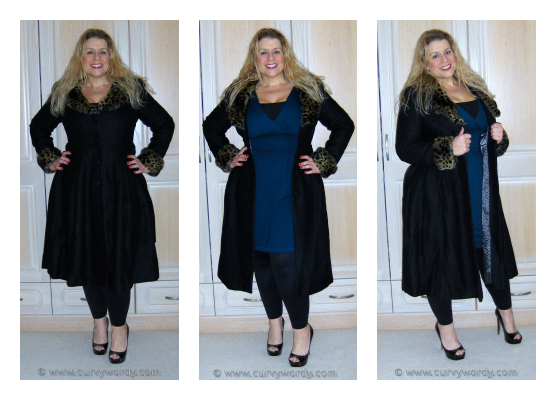 My disappointment was consolidated further when I read my friend Georgina’s review of the Ashley coat – the lucky girl had managed to nab one in black and looked stunning in it! Thankfully, my natural tenacity didn’t let me down and when Collectif had a massive 40% discount code at the end of 2012 which applied to everything online (except accessories), I emailed the team to ask if there was any chance there might be an Ashley hiding in a warehouse somewhere. As luck would have it, there was. I could hardly believe that I’d managed to get myself a size 18 in black with 40% off! You can probably tell from my face how much I love this coat. It is absolutely wonderful. The low cut neckline is just fabulous and gives a cheeky hint of cleavage. The collar and cuffs are edged in the softest leopard print faux fur which adds to the coat’s sophisticated look and feel. The fibre content of 67% polyester, 30% wool and 3% elastane offers wonderful warmth with superior fit. There are two pockets on the hips, just below the belt line, which come in handy but I do wish they were a little bit deeper. I love that the Ashley coat is long enough to wear with my Dolores Doll dresses (they peek out at the bottom only very slightly) and it more than covers my knees. I discovered the other day that if I wear the coat when driving it ends up covering my legs completely, because of the driving position, which means I remain toasty and warm, even on very cold days. Because the skirt is so full, it also means that when sitting down the coat does not fall open. My previous coat was terrible at that I’d be forever yanking it around my knees in an attempt to close it and stop the draught. Ashley is almost like wearing a blanket across your lower half – it’s so warm and cosy and there’s plenty of coverage. Fortunately the belt saves the day and provides the cinching effect required. The coat is lined with beautiful navy polka dot fabric that’s soft and silky, which makes the coat easily to slip on and off. I was excited to discover that the cuffs actually fold down, as demonstrated in the picture above, and can be worn this way. This will undoubtedly be an added bonus on particularly chilly days when gloves are not enough to keep my hands warm. Having owned the black Ashley for a few weeks I was tempted to get one of the other colours. I knew I’d be heartbroken when the time eventually came that this coat needed replacing so I thought I might as well delay this moment by getting another. Yes, sometimes my reasoning baffles me too! 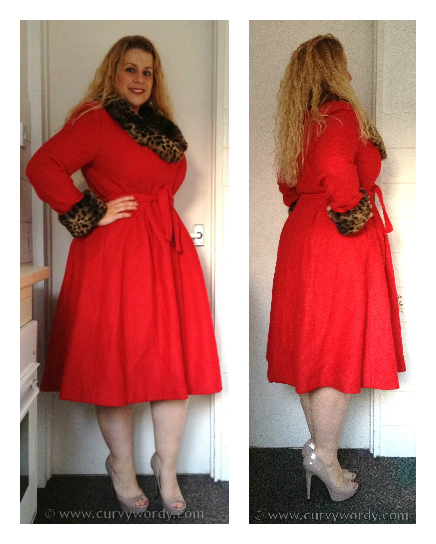 I got in touch with Collectif again and it wasn’t long before the red Ashley came into my possession. This was again a size 18 but without a discount as the offer period had ended a few weeks previously. I had, however, bought a £100 gift voucher with 40% off, which I was able to put towards the cost of the coat. It all helps. The best thing about the Ashley coat is how it makes me feel. Its feminine shape and simple but show-stopping style makes me feel all girly and elegant. I feel like I walk taller in this coat and wish I could wear it all day long! The red is simply stunning and a gorgeous shade – rather than a dark red it is bright and almost orangey. It’s really eye-catching and makes me feel bright and cheery whenever I wear it. I mentioned previously the low cut neckline, which is such an adorable shape. I have found it to be a little chilly on very cold days so I simply add a pashmina and tuck it in to ensure I am comfortable. I do love having this coat in two colours as they give me a multitude of wardrobe options. However I am wondering about having the leopard print fur on the red coat replaced with plain black so it is a little more different. This will also make the coat wearable with patterned scarves (of which I own several!). What do you think? Should I keep it as it is, or change it for black? 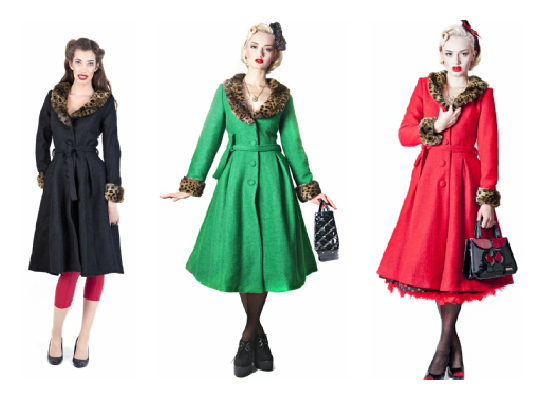 Collectif make a number of other lovely coats, including the Gretel, which has just come back in stock. I tried one on instore recently and although I loved the styling, it wasn’t as good a fit on me as the Ashley. The cape of the Gretel added bulk and the absence of a belt meant my waist lacked definition. The fabric is lovely but not as soft as my Ashleys and is without stretch, which for me is crucial in the majority of my clothing in order to get best fit. In my opinion, the Gretel is a better option for those who have less of an extreme ratio between their measurements, i.e. someone who is less curvy. The Gretel will add the impression of curviness to your figure with the cape and flared skirt, and the pompoms and hood add to the fun appeal of this lovely coat. I also like the Mariella Leopard Long Coat. 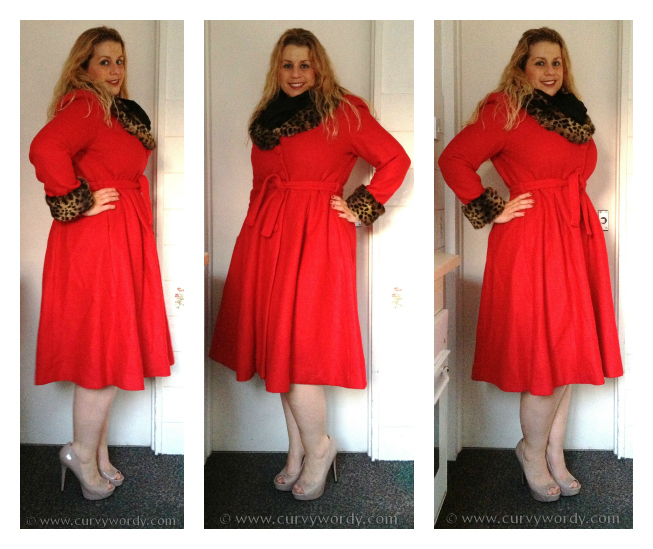 It’s a swing coat so the waist is not defined but I tried something similar on instore and added a stretchy waist belt and it looked fantastic! This one would be great for wearing lots of layers underneath as it’s a little looser than the others, although the arms remain fitted. And it’s on sale now so if you like it, don’t hesitate or you might miss out! 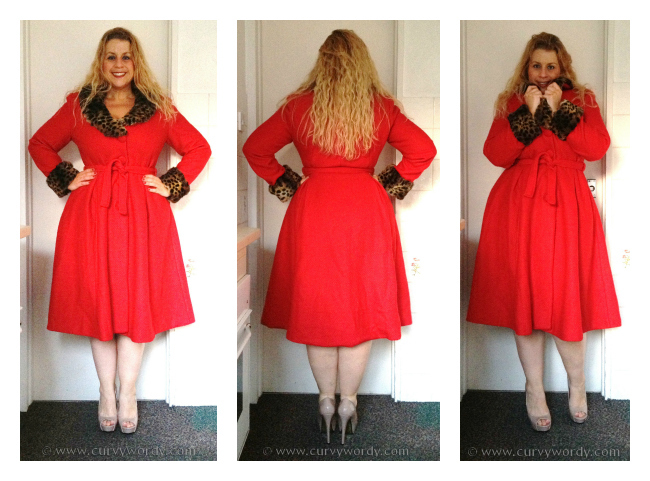 Have you tried Collectif coats? And which of these I’ve shown here is your favourite? Haha great idea! I think this coat would work well with all outfits but it's definitely on the dressier side of the equation. I love it though – I tend to dress fairly smartly even when dressed down so it's perfect for my needs. I think the red coat would look more classic and beautiful with black fur trim. And it would be different. I say go for it. That coat would look great with beautiful scarves. I think so too. I shall have to located a decent seamstress and good quality faux fur. wow looks great on you! I ordered the red and black late friday night after reading your review. Just hope they fit ok seeing as they're completely sold out on the site now. Can't wait to get my paws on them, so excited! Just had another look at the site and the ashley coats ARE still there ladies… For some reason they weren't earlier this eveningAnyways thanks for the thorough review Curvy Wordy!